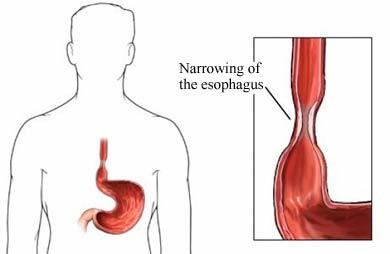 Esophageal stricture happens when the esophagus narrows. It’s hard to get food down the tube that goes from the mouth to the stomach. The tube is called the esophagus. Esophageal dilation —To stretch or widen the esophagus. A scope is passed through your mouth. It then goes into the esophagus. A balloon or plastic dilator will widen and open the narrowed part. Medicines—In some people, GERD causes these problems. Your doctor may give you medicines. These will lower the amount of acid in the stomach. They may also help keep the narrowing from coming back. Follow your doctor’s instructions on caring for certain conditions that cause it. Get help right away if you or someone else swallowed harmful substances. Keep harmful substances locked up and away from children. Caustic esophageal stricture. EBSCO DynaMed Plus website. Available at: http://www.dynamed.com/topics/dmp~AN~T114901/Caustic-esophageal-stricture . Updated August 8, 2014. Accessed August 14, 2018. Esophageal stricture. Cedars-Sinai website. Available at: https://www.cedars-sinai.edu/Patients/Health-Conditions/Esophageal-Stricture.aspx. Accessed August 14, 2018. Gastroesophageal reflux disease (GERD). EBSCO DynaMed Plus website. Available at: http://www.dynamed.com/topics/dmp~AN~T116914/Gastroesophageal-reflux-disease-GERD . Updated September 14, 2017. Accessed August 14, 2018. Oesophageal strictures, webs, and rings. Patient website. Available at: https://patient.info/doctor/oesophageal-strictures-webs-and-rings. Updated February 15, 2017. Accessed August 14, 2018.